Registration will be closed at 11:00, 9 Mar., 2018. Those who are not registered may try to walk in on a first-come, first-served basis. 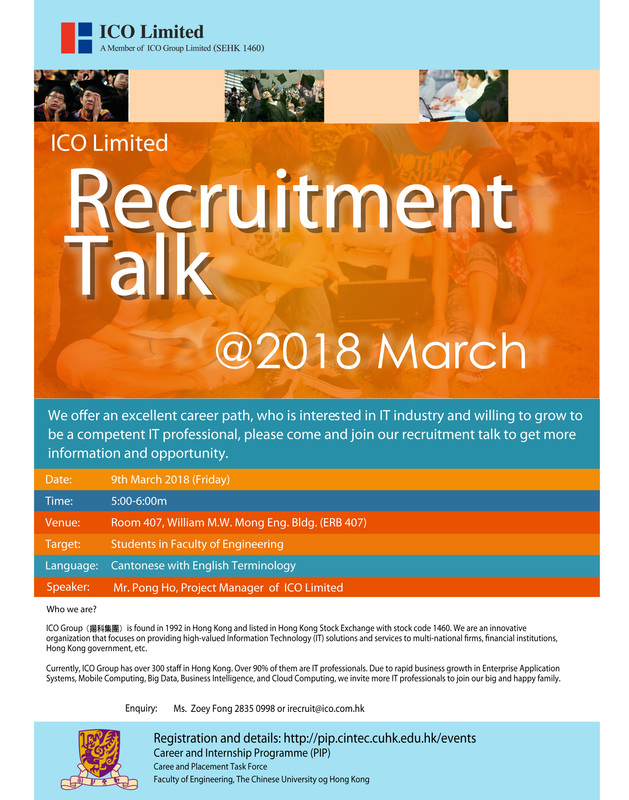 We offer an excellent career path, who interested in IT industry and willing to develop to be a competent IT professional, please come and join our recruitment talk to get more information. ICO Limited is founded in 1992 in Hong Kong. We are an innovation organization that focuses on providing high-valued Information Technology (IT) solutions and services to multi-national firms, financial institutions, Hong Kong government, etc. 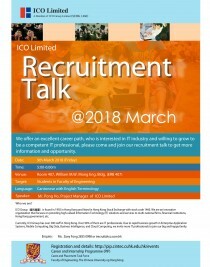 Currently, ICO Group has over 300 staff in Hong Kong. Over 90% of them are IT professionals. Due to rapid business growth in Enterprise Application Systems, Mobile Computing, Big Data, Business Intelligence, and Cloud Computing, we invite more IT professionals to join our big and happy family.